When tracking SEO performance, the Visibility Score is the key metric to follow. Expressed as a percentage, it shows a website's impression share out of the total number of searches for a list of keywords. Because the Visibility Score isolates SEO performance from other factors, like search seasonality or trends, monitoring its progression gives an accurate, real-time picture of how well the website ranks in Google for a list of keywords. Here are some tips of how to interpret the changes in Visibility and how to correlate them with other data available in the platform. On the left side in the SEO Campaign module, you can have a first quick overview of how each of your keyword groups adjusted its Visibility Score. Note that all the changes refer to the selected timeframe, reflecting the rank fluctuations between its first and last dates. When you click on any of the Visibility changes, you can see detailed information about how that particular change was calculated. As it can be noticed in these explanations, the change in Visibility is mainly caused by rank fluctuations. However, slight changes might also come from adjustments in the average search volumes, which we refer to as search trends. It is easy to understand how the change in ranks affected the Visibility Score. The explanation box lists the five rank changes with the greatest impact in Visibility. This information is particularly powerful when dealing with big keyword portfolios, because it takes the burden off of looking through hundreds or even thousands of rank changes, to figure out which one might be responsible for a traffic loss. A noteworthy observation is that the keywords are not sorted by how many ranks they gained, but by how much their gain has impacted the Visibility. Thus, climbing one position for keyword no. 1 counts more than gaining 13 positions for keyword no. 2, because of the significant difference in search volume. Keyword no. 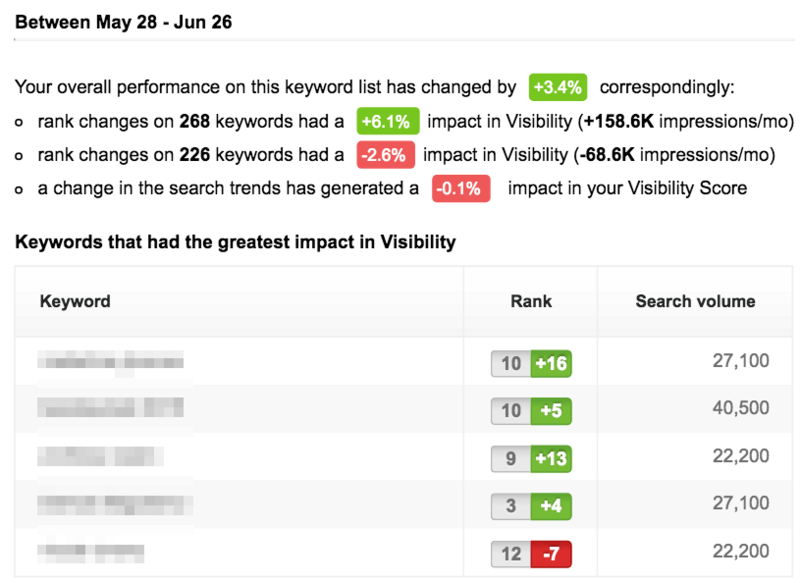 1 impacted the overall Visibility more than keyword no. 5, because moving from position 12 to position 3 would bring exponentially more impressions than moving from position 19 to position 10. Search volumes play an important role in the Visibility Score formula. When they change, they impact your Visibility even when rankings remain the same. the keywords for which you don't rank well decrease their search volume. your not-so-good keywords gain volume. Normally, these changes shouldn't be too significant (in the example: -0.1% out of a total of +3.4%) and they might also be reflected in the Year-over-Year trend. In conclusion, the Visibility Score crunches all the relevant data in order to show you the one figure you are most interested in: the impression share or, in other words, how visible your website is in Google searches on a list of keywords. This is why tracking the changes in Visibility guarantees you the best perspective on your website's SEO performance.